Bloomberg reports that Research in Motion's 7-inch BlackBerry PlayBook tablet is set to debut in the first quarter of 2011 with an entry price of "under" $500, putting the device at or below the price point of Apple's iPad. Just how far under $500 the PlayBook will be priced remains to be seen. Research In Motion Ltd., the maker of the BlackBerry smartphone, said it will begin selling a tablet computer in North America in the first quarter for "under" $500 as it takes on Apple Inc.'s iPad. "The product will be very competitively priced," Co-Chief Executive Officer Jim Balsillie said in an interview in Seoul today, declining to be more specific. 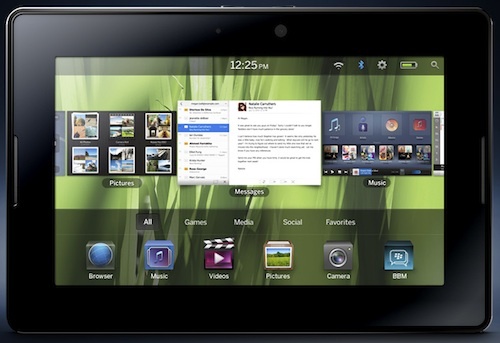 Sales of the BlackBerry Playbook, unveiled in September, will expand globally from the second quarter, he said. The iPad starts at $499. The initial PlayBook models will be Wi-Fi-only, suggesting that the sub-$500 price would not be achieved through carrier subsidies requiring the user to also commit to a data plan contract. The Wi-Fi PlayBook will, however, be able to tether to BlackBerry phones for data access on the go, and 3G and 4G models are planned for further down the road. According to Balsillie, Research in Motion is looking to follow Apple's lead in embracing big box retailers with its tentative plans to bring the PlayBook to Target and Wal-Mart. Distribution would also be accomplished through carriers already familiar with selling the company's products.